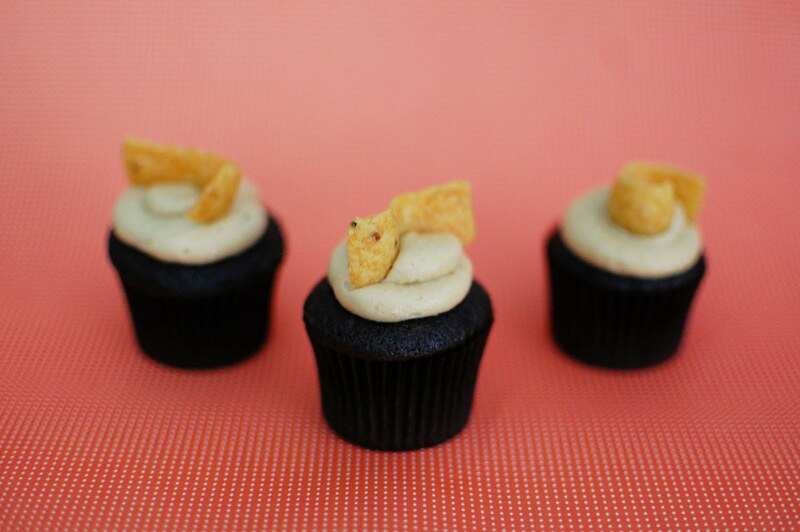 Yes, you read that correctly – Frito cupcakes. I get a lot of crazy looks when I say I’m making Frito cupcakes… but don’t worry, they’re not scary at all. If you were at Cupcake Camp last night, you may have had the chance to try these little babies yourself. I hope you enjoyed them as much as I did! You all know I’m a huge fan of the salty-sweet, chewy-crunchy combos. These cupcakes have it all. 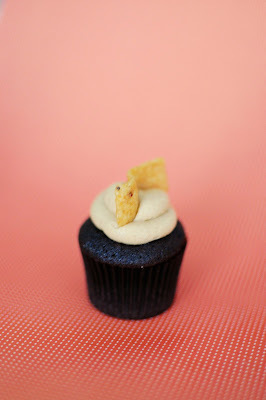 I’ll be doing a whole Cupcake Camp recap post next week so today I’m going to focus on these cupcakes. I went with mini cupcakes, but these would be great full-sized as well. You can use your favorite chocolate cupcake recipe, but I definitely recommend this peanut butter frosting recipe. I first used it to make some chocolate peanut butter cupcakes and since then it’s been my go-to peanut butter frosting recipe. It’s so smooth and delicious. Since I’m kind of crazy about having pretty smooth frosting, I only added the crushed up Fritos to the filling portion of the cupcake. 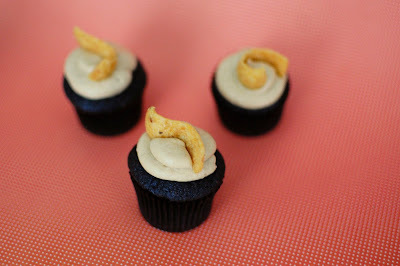 If you didn’t want to go through the extra step of filling the cupcakes, you could just slather the Frito/PB frosting on top of your cupcakes and that would also be delicious. Allow cupcakes to cool completely. Using the cone method, remove a cone off the top of the cupcakes. Discard the tops, or eat them, or freeze them to snack on later. Fill the cupcake with the Frito filling. Frost with peanut butter frosting and top with a Frito. Divide batter into lined cups, filling each three- quarters full. Bake, about 10-12 minutes. Cupcakes can be stored overnight at room temperature, or frozen up to 2 months, in airtight containers. Put Frito scoops into a plastic bag and crush with your hands or by using a can of food. In a small bowl, stir together frosting, crushed Fritos, and salt. Don’t forget about Bloggers Bake for Hope – Bloggers Bake. You Bid. 100% of proceeds go to Komen for a Cure. Register to bake by April 30th, come back for bidding May 4-6. Dark chocolate truffles in cookie form? Um, YES!!! I’ll take a dozen for myself and another dozen for later, please. Wow – these sound good! and I truly do not understand how people can just “not be into chocolate!” It is my favorite! Yea, I really don’t get it either. Oh well, more for me! Oh wow, chocolate truffle cookies sound divine! These look ridiculously good! Love that they’re salted too! I have been sprinkling salt on all of my cookies recently. It makes them much more adult and less super-sweet. I’m always in need of a chocolate fix! I have several friends that claim they are not chocolate people, yet I find whenever I make something chocolate + salt, they are all over it! I definitely find that people who claim they aren’t chocolate people rarely say no to any homemade baked goods. Chocolate or otherwise. Oh my! These look divine 🙂 I’d love to make these babies soon! these look amazing!! and how thick that batter is 🙂 love the sea salt! The batter was basically ganache. You could have just made truffles from it directly. I love any and all things dark chocolate. These look so decadent! Just made these. Worried I didn’t bake them long enough… however they still tasted divine. Waiting to get the verdict from my husband on them. I think underbaking these sounds like a great idea. I might have to do that next time. Since I’m trying this recipe for the first time, can I halve the entire recipe? Sorry for not getting back to you sooner. I didn’t see this comment until now! I don’t see why you couldn’t make a half batch of these cookies. Did you try it? How did they turn out? These are the most amazing chocolate cookies I have ever made. Everyone with whom I have shared them have gone absolutly nuts and want the recipe. I do not wet my hands when rolling the cookies into balls—too messy. I just let my hands get sticky and rinse and dry them after making several balls. This is one of the best recipes on Pinterest. Thanks for the kind words! So glad you enjoy these cookies. I was wondering if getting my hands wet actually helped with the messiness very much. Next time I’ll be sure to just go at it without dealing with the water. I tried just one batch. Anything I can do to fix the remaining batter? Interesting… How did you account for half of an egg? And is your baking powder past it’s expiration date? Ohh! Looks like I’ve added a lil too much egg. Damn! Any way I can fix the batter? Add more flour perhaps? Plz help! I’d add a little more flour to see if you can balance out the extra amount of egg in there. I added 1/4 cup more flour & a teensy bit of baking powder to my messed up batter & they came out wonderfully! They’re so gooey & yumm that my husband & son (who never eats chocolate!) finished six cookies at one go! Amazing recipe!! Thank you so much for your help, I appreciate it ! Oh GOOD! So glad you were able to make them work. Aren’t they divine? U bet! They are sinfully delicious! Sent some in my son’s snack pack & I have mommies calling for these cookies! Hi, I was wondering if I could put them in the freezer instead of the fridge for a shorter period of time? If so, how long should I put them in the freezer for instead of the fridge? Hm. You could definitely try it. I would think it’s still going to need an hour or so in the freezer since you want it to set up pretty well. Let me know how it turns out if you do.